The most reasonably-priced Riviera sportfish in its class in the entire US Market! Ready for season with fresh bottom paint, Prop Speed, Zincs and more.This 2008 47 Riviera is loaded! It is the perfect balance of a serious fishing machine or family friendly cruiser for extended traveling and extra accommodations for guests!This boat has the upgraded and preferred Caterpillar C15 engines making 865hp each and providing an economical cruising speed of 27 knots and a 440 nautical mile range!The spacious flybridge features plenty of seating while cruising or venturing offshore exploring uncharted fishing grounds. Cruiseair air conditioning and heating provide all weather comfort in the fully enclosed isinglass helm. Helm also features an abundance of electronics with redundant VHF, GPS, chart plotter and sounder.The large cockpit includes a teak Release fighting chair for catching a trophy or sitting back and relaxing. The living area features a large salon, well appointed U-shape galley with plenty of storage to include an overhead rod locker, 3 stateroom layout with queen berths in the VIP and Master staterooms with ensuite heads and a port side bunkroom.All maintenance is up to date, boat shows well and is turn key ready for her next owner to enjoy!Vessel just had (Feb. '17) complete bottom job, props tuned and balanced with prop speed and hull was polished and waxed and is READY TO GO!!! United Yacht Sales New Jersey would love to guide you through a personal showing of this 47' Riviera 47 Flybridge 2008. 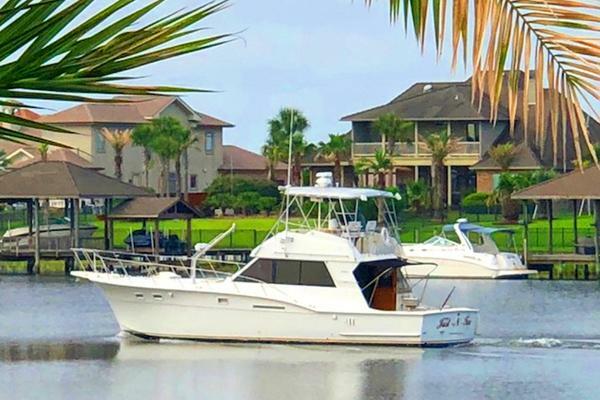 This yacht for sale is located in Orange Beach, Alabama and priced at $497,000. For a showing please contact us by filling out the form on this page and we will get back to you shortly! Large L-shaped leather dinette forward and to starboard.